Not far from the Bald Head lighthouse and just above Southport stands this little harbor light called Price’s Creek lighthouse. It was one of seven such lights along the twenty-five mile stretch up the Cape Fear River from Oak Island to Wilmington and were built to help vessels navigate the bends in the river channel. Now dark and abandoned it was never re-lit after the Civil War after it was used as a Confederate signal station. The Confederates destroyed all the other river lights when they began to loose control over the river. The small twenty-foot tall lighthouse is seventeen feet in diameter at the base with three foot thick walls at the bottom graduating to two feet at the top. The lantern room is gone now but originally it was fitted with eight lamps and eight fourteen inch reflectors when it was built in 1849. These were the Lewis Lamps that were in general use at the time and were not very effective. All the bricks for the Prices Creek lighthouse and the keepers house were thought to be brought over from England. Years later when the house was demolished many of the bricks were gathered up and used in the construction of a home in Southport. Living with bare essentials back when the Prices Creek lighthouse was built was a normality and life was difficult at best. Diseases such as yellow fever effected many people and although there was not a huge epidemic here like there was at St. Joseph Sound in Florida where the entire population died because of the disease1849, there were cases of yellow fever in the area around Prices Creek lighthouse, Southport and the Bald Head Island area. In the late 1800’s as shifting sands along the bank were washed away, residents sometimes found open coffins with skeletons in them from yellow fever victims as they walked along the shore. All it took was one sailor to come into town that had it and within a short time the whole town could be wiped out. If you were one of the unfortunate souls to contract the disease, here is what would have happened to you. Three to six days after you were exposed to it, the disease would have finished incubating, and symptoms would manifest suddenly. It would start with a headache, backache, and fever. Then you would begin to have nausea and vomiting. Your temperature would return to normal for a few days, but then it would rise again. Your skin would turn yellow from an accumulation of yellow bile pigments in your body. Then you would begin to bleed from the nose and to vomit blood (It was called “black vomit.”). Your kidneys, liver, and heart would begin to fail, and you would die between the fourth and eighth day after your symptoms began. If by some miracle you survived (and some people did elsewhere), your convalescence would be quick. The jaundice would persist, but you would be immune to yellow fever for the rest of your life. Now as busy travelers and businessmen take the ferry past this last surviving harbor light on the river, those difficult times are all but forgotten except for a few photographs and notes in history books. The lighthouse sits alone on the river as the only reminder, dwarfed in the background by a large chemical plant owned by the Archer Daniels Midland Corporation thats produces citric acid used in many food products including soft drinks and primarily used to make things tart. In front of the lighthouse a massive pier further diminishes the already small lighthouse where large ships dock to offload raw materials. When I was there new wooden stairs and window casements had been built but other than that it was quite over grown. The lighthouse is on private property and it unlikely that you would gain access to it by any roads on company property. Viewing it from the river is your best bet. The ferry boat landing at Southport, not the ferry that runs to Bald Head Island, but the one that runs to Fort Fisher is a good place to see the lighthouse. 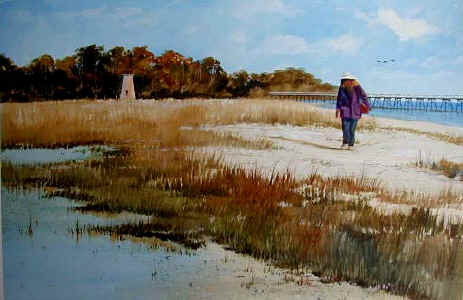 Fort Fisher is where there was once another lighthouse called the Federal Point lighthouse but nothing remains of it now. If you have your own boat there is a public boat ramp at Southport but a hard current on the river up by the lighthouse will warrant some caution if you’re using a small boat. Of course two other lighthouses are nearby that you can get close to and they are Oak Island lighthouse just to the south and Bald Head lighthouse, often called Cape Fear lighthouse, within sight of Prices Creek.